Apr. 18th, 2007 13:00 by — Permalink | TrackBack: http://boursomac.com/trackback/458 — updated on Apr. 19th, 2007 16:00 exists for 12 years & a weekπριν — — Θλιβερό, αυτό το περιεχόμενο δεν είναι διαθέσιμο στα ελληνικά. - Intel. "Welcome to the era of multicore, an era in which all of our computing capabilities will multiply our own personal capabilities." Intel just revealed the details of the next-generation processors, they will belong to the "Penryn" family after they annouced a $2,5 billion investment in China, to build a fabrication facility for the 300mm wafers. The Penryn processors -- build at 45nm (45 billionth of milimeters) -- running at 3,3GHz, with a front side bus (FSB) at 1,333GHz and 12MB of cache! The first tests showed a performance increase from 15 to 40% for desktop applications versus the Intel Core 2 Extreme processors. For high-performance computing (HPC), like Java servers, an increase of 45% is expected against the Quad-core Intel Xeon! With this multicore era, where several chips run in parallel, a new way of programming is necesary, and so a new architure named "Larabee" has been created, where we expect TeraFLOPS performance! This architecture will be compatible with most of the existing developer tools. Intel has also annouced the production of future graphical chips to increase considearly the game performance under Direct X, the Intel Viiiv, even so that it may not concern the Macs. 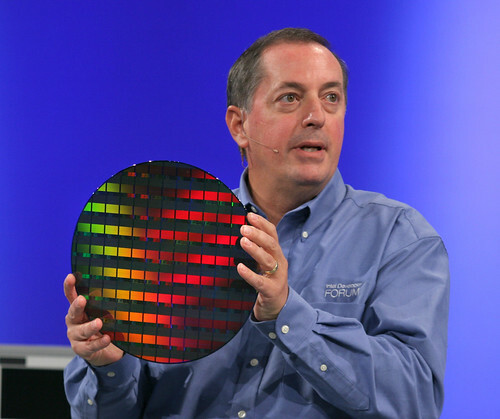 In the future, Intel hopes to decrease by a factor 10 the energy consumption of the processors in 3 years by 2010. And the future really belongs to multicore computers, as demonstrated by the demo of a 80-core machine earlier this year.